Do you need some easy Easter craft projects for the kids? I have several fun, simple and totally easy to complete craft projects just in time for Easter Sunday. While my family celebrates Passover, since my "day job" (really usually" middle-of-the-night when the kids are asleep job") is to write about crafts, I found a few Easter crafts I couldn't not share. These Easter crafts are great for kids of all ages - older kids will need less help, and younger kids will need more help. Also, babies love it when you just do the whole thing for them and sign their name and date it for their baby book. Embellished Duck Tape Easter Eggs - I've written about making Duck Tape Easter Eggs before, but then I couldn't leave those eggs alone, so I used Mod Podge and added sequins. The eggs turned out really cute - and even better, the sequins didn't fall right off - yay. Decoupage Easter Eggs - I had been wanting to do this since I saw some way better versions on Pinterest, and while mine may not be total Pin-fection, I was also pretty happy with how these eggs came out. To make decoupage Easter eggs, just cover a plastic egg with Mod Podge, then cover with tissue paper or a decorative napkin of your choice (I used a translucent flower cupcake wrappers, and then cover the whole thing again with Mod Podge to ensure the paper stays down and also to give the egg a nice glossy cover. Rhinestone Easter Eggs - We had a lot of sticky rhinestones from some other craft project, and I thought they would be perfect to bling out some Easter Eggs. 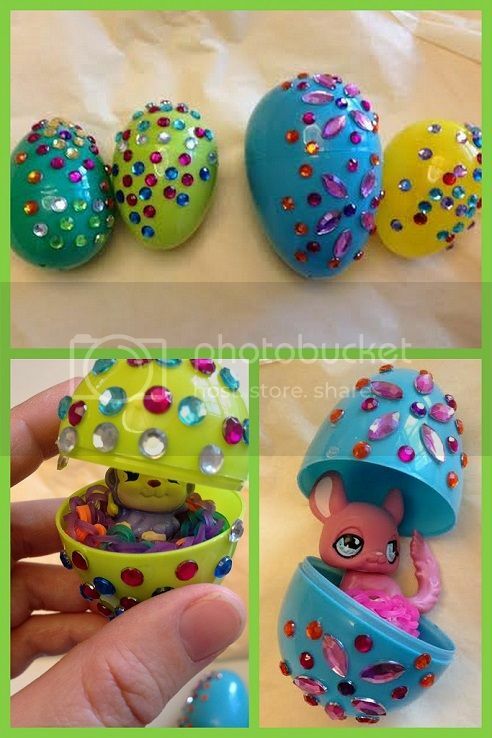 The advantage to these eggs, unlike the ones above, is that you can still open the plastic eggs and fill with Rainbow Loom bracelets, Littlest Pet Shop guys, and various other trinkets. Ice Easter Eggs - This was my "brilliant" idea based on someone else's actually brilliant idea on Pinterest. I thought it would be really cool to freeze stuff (sequins, Squinkies, little toys, etc.) in plastic Easter Eggs and then the kids could crack 'em open and discover and play with the little treasures that ha d been frozen inside. The problem, however, was that Easter Eggs divide in the middle so there's no way to put an egg-shaped amount of water into the egg (actually, I'm sure there is a way, but I don't know it).